1½ – 3 inch thorns. This thornless variety is a selection of cockspur hawthorn species without the large thorns. Where it came from is not clear in the research of horticultural publications. Growth Habit: Tree is densely branched and has a strong horizontal branching habit; 20 feet tall by 20 feet wide. Once established it is a reliable grower putting on as much as 6 – 10 inches of branch growth a year. Leaves: Thick dark green glossy leaf. 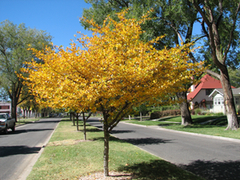 Attractive fall leaf color can be yellow to orange. Twigs: One year old twigs are reddish-brown. Older twigs are gray and thornless. Flowers: Clusters of simple creamy white flowers that form in late spring. The flowers have an unpleasant odor. 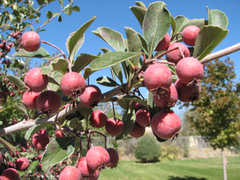 Fruit: Dull red berry up to ½ inch that persists into fall months. Tree does have a prolific fruiting habit. When fruit does fall it can be abundant and messy. Bark: Gray brown, with flaking bark as tree trunk matures. 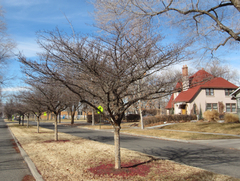 Landscape Value: Tree is a stout ornamental variety suitable for planting under overhead power lines. 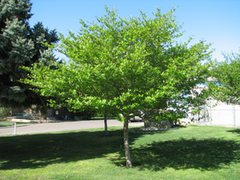 This tree has proven to be drought resistant and tolerant of different soil types. The glossy foliage, lack of thorns, unique growth habit, spring flowers, fall fruit, and attractive fall color will provide diversity to the landscape through all of the seasons of the year. Dense branching habit warrants regular interior pruning to eliminate conflicting branches. 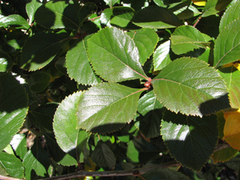 Insects and Diseases: Somewhat resistant to leaf fungal rusts that can affect other hawthorns in Colorado and no major insect problems to report.